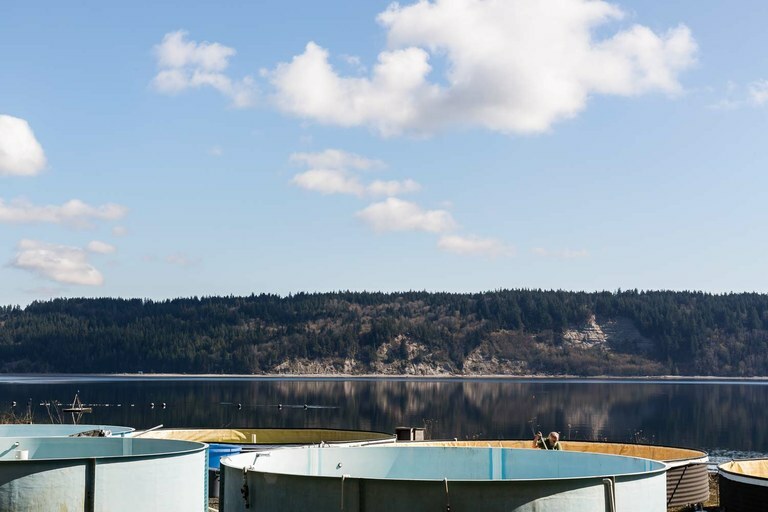 Taylor Shellfish Farm’s Quilcene hatchery perches on a narrow peninsula that juts into the sinuous waterways of Washington’s Puget Sound. On the July day I visited, the hatchery and everything surrounding it seemed to drip with fecundity. Clouds banked over darkly forested hills on the opposite shore, and a tangy breeze blew in from across the bay. But the lushness hid an ecosystem’s unraveling. Climate change is altering the very chemistry of surface seawater, causing ocean acidification, a chemical process that is lowering the amount of calcium marine organisms can access. Acidification is a relative term; the oceans are not actually turning into acid and will not melt surfboards or sea turtles anytime soon. Still, with enough acidification, seawater becomes corrosive to some organisms. Hardest hit are calcifiers, which use aragonite, a form of the mineral calcium carbonate, to make shells, skeletons and other important body parts. Examples of calcifiers include crabs, sea urchins, sea stars, some seaweeds, reef-forming corals, and a type of tiny floating marine snail, or pteropod, called a sea butterfly. Shellfish, including oysters and clams, are also seriously affected. With the disappearance of many of these sea creatures, oceanic food webs will be irrevocably altered by century’s end. People have harvested shellfish in the Pacific Northwest for thousands of years. Today, the industry generates more than $270 million annually in the state of Washington alone. A decade ago, the region’s shellfish growers were already reeling from harmful effects of climate change, so they have been in some ways at the forefront of climate adaptation. I’d driven to Taylor Shellfish Farm to learn how they were working, with scientists and others, to save their livelihoods and the coastal ecosystems they’re built on. Dave Pederson, the hatchery manager, met me in a bright building full of burbling saltwater tanks of assorted mollusks. A tall, fit man with a graying beard, Pederson led me outside behind the hatchery. Two hundred feet below us, glittering blue water splashed against the steep cliffside, while inside the hatchery, tiny oysters, mussels and geoducks — pronounced “gooey ducks” — filtered algae soups, carefully concocted by hatchery staff. Yesterday, workers had spawned Pacific oysters, which within hours built their first shells from seawater calcium. 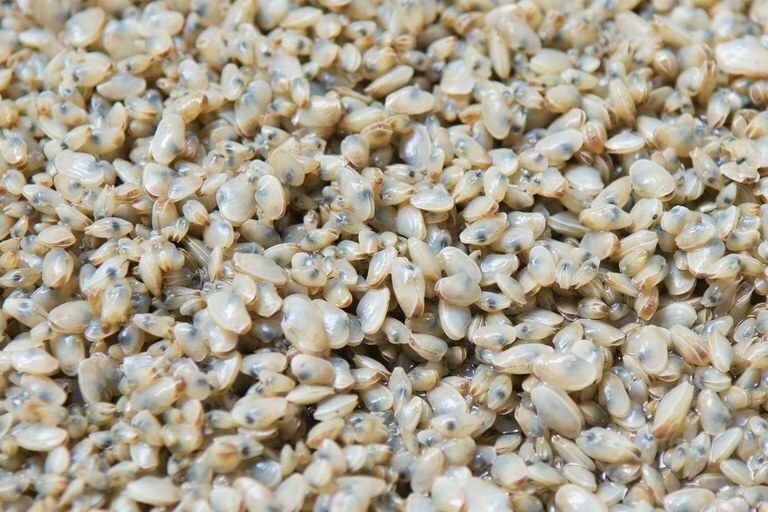 Throughout the hatchery, millions of baby bivalves grew from mere specks to identifiable mollusks, fated to gleam on half shells in trendy Seattle oyster bars, or be whisked off to Asia by FedEx flight. For more than 250 years, since the Industrial Revolution’s beginnings, the ocean has absorbed approximately a third of the carbon dioxide that humans have produced, slowing the impacts of climate change on land. But since 1750, the average acidity of its surface water has increased by almost 30 percent. The ocean is acidifying 10 times faster now than it has in the past 50 million years. Scientists don’t yet understand what this means for sea life, but ocean acidification already affects Pederson and others who rely on the ocean. He and other farmers, along with researchers and policymakers, are searching for lasting solutions to the regional climate change impacts they are witnessing. Meanwhile, worries about the planetary implications of ocean acidification keep growing. 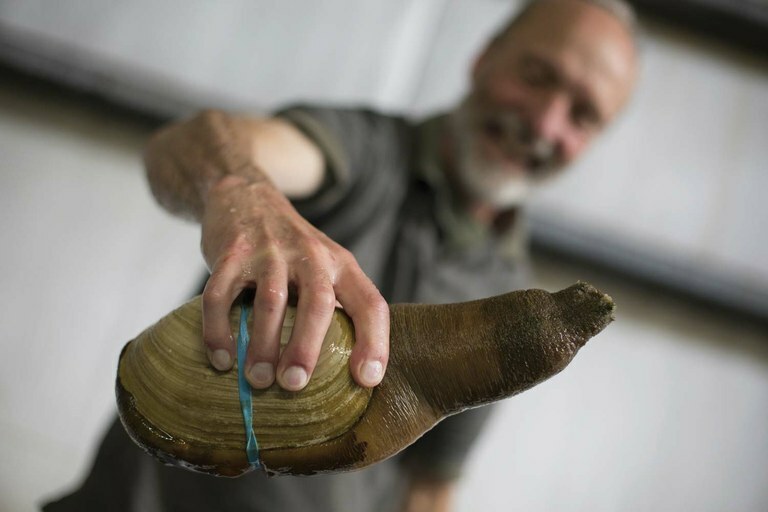 Dave Pederson, hatchery manager at Taylor Shellfish Farm in Quilcene, Washington, holds a geoduck — the hatchery’s second biggest seller, after oysters — grown mostly for export to Asia. Humans have lived along North America’s West Coast for millennia, in part because of a maritime phenomenon that occurs in only a few places on Earth: seasonal coastal upwelling. First, surface seawater near Japan sinks into a deep-water current well below sunlight. That current carries the water to North America, a trip that takes between 30 and 50 years. Decaying pieces of marine plants and animals come along for the ride, providing a feast for carbon dioxide-releasing bacteria that naturally acidify the surrounding water. Eventually, this deep current reaches the West Coast, where a southerly wind blows the surface water out to sea. Then the nutrient-rich water from the North Pacific rises, nourishing the seaweed and phytoplankton that thrive in sunlit surface waters. That growth is the foundation for the West Coast’s incredibly diverse food web, which supports some of the most productive fisheries in the world. Even before human-caused climate change, the organisms of the Pacific Northwest lived at the edge of their tolerance for acidity. Now, though, surface water absorbs so much atmospheric carbon dioxide that by the time it upwells again, its acidification will reach problematic levels. Aboard the research vessel affectionately known as Cliffy, researchers haul in the canisters and sensors that take readings as they collect samples in Puget Sound, Washington. A decade ago, most people — including scientists and shellfish growers — had never heard of ocean acidification. But in 2007, following a hunch, National Oceanic and Atmospheric Administration oceanographer Richard Feely put to sea on a research trip off the West Coast of North America. Feely had found dissolved carbon dioxide levels in surface waters of the continental shelf off Northern California that were much higher than he’d expected. While Feely thought those high recordings hinted that an upwelling event was happening, he had no idea of the magnitude or extent of the acidification he was about to discover. Feely assembled a group of marine researchers who sailed from Canada to Mexico, collecting and analyzing water samples along the way. They had a bet going about when they would see ocean acidification. All of them turned out to be wrong, because it was everywhere: Corrosive waters registered from Vancouver Island all the way to Baja California. Feely and his colleagues estimated that by the end of the century, marine creatures throughout the entire ocean would have access to dramatically less calcium carbonate because of ocean acidification, with regions of coastal upwelling hit especially hard. Even as Feely conducted his 2007 cruise, shellfish farms throughout the Pacific Northwest were failing. About two days after hatching, all 2 million oysters in a set would die. Whiskey Creek hatchery — one of the industry’s largest suppliers of shellfish larvae to farms — produced only 2.5 billion “eyed” larvae in 2008, just 25 percent of what it normally produced in a season. As one bad season stretched into two, farmers focused on the usual suspects. Thinking a bacterium called Vibrio tubiashii was to blame, growers would halt operations, clean out their tanks, and add new water and new stock, only for their oysters to die again. The growers were mystified. Then, in 2008, Feely and the other researchers published their findings. Later that year, the Pacific Shellfish Growers Association invited Feely to present his research at its annual meeting. The reality, the growers learned, was much worse than a common bacterium: Essentially, as their baby oysters struggled to pull enough calcium from acidified seawater to form shells, they ran out of energy and starved to death. Geoducks by the millions grow in specially formulated algae mix and protected from acidified ocean water at the Taylor Shellfish Farm hatchery in Quilcene, Washington. Greg Dale, southwest operations manager at Coast Seafoods Company in Northern California, watched Feely’s presentation. Raised in a fishing family from Alaska, Dale began working at an oyster farm as a student at Humboldt State University. At first, it was just a job, but he ended up loving the work. At Coast Seafoods, Dale raised oysters both to sell as baby “seeds” and as ready-to-eat adults. The adults were transferred to tidal mudflats, where they grew individually in baskets of powdered shell, or on pieces of shell stuck in braids of rope that trail up from the bottom of the ocean like underwater vineyards. For two terrible years, though, Dale’s oyster seeds died before they ever left their tanks. In some cases, their tiny shells seemed to dissolve. Feely’s keynote presentation explained what Dale and the other growers were witnessing at their hatcheries: Before the Industrial Revolution, the upper ocean’s average pH was 8.2. The pH scale, which measures acidity, goes down as acidity goes up. It’s now 8.1, a deceptively small-sounding difference: The ocean is actually 30 percent more acidified. And in the summer of 2008, because of seasonal upwelling, hatcheries recorded seawater pH levels as low as 7.6, which explained the havoc shellfish farms were experiencing. If carbon dioxide emissions continue increasing as predicted, by the end of this century the ocean’s surface may become on average 150 times more acidified than it was before the Industrial Revolution, with a pH of about 7.8. This would be disastrous for a lot of marine life, especially in areas such as the Pacific Northwest. Word of the researchers’ findings spread. Pacific shellfish growers quickly went to work with state and federal biologists to adapt, so their stock could survive in a changing ocean. They tried filling their water tanks in the afternoon, rather than the morning; this improved the baby oysters’ chances of survival because photosynthesizing plants took up some of the seawater’s carbon dioxide. Shellfish continued to die, but there was enough improvement to suggest that things were headed in the right direction. Next, researchers put the same pH and carbon dioxide sensors they had had on their ship into hatcheries. Scientists also taught farmers how to add calcium carbonate — soda ash — to seawater coming into their hatcheries, raising the pH in tanks. Hatcheries even shortened their spawning season to avoid the acidified late-summer conditions of the sound. Which is not to say that the tools they used were pretty. Tracking the measurements that shellfish growers rely on — such as carbon dioxide levels and aragonite saturation levels — in real time is complicated. Burke Hales, an oceanographer with Oregon State University, constructed a device, resembling a plastic travel trunk sprouting machinery and colored wires, that hatcheries could install to monitor conditions. Now, when conditions are bad, growers don’t spawn oysters. The co-owner of another hatchery named the contraption, which has since been trademarked, the Burke-o-lator. 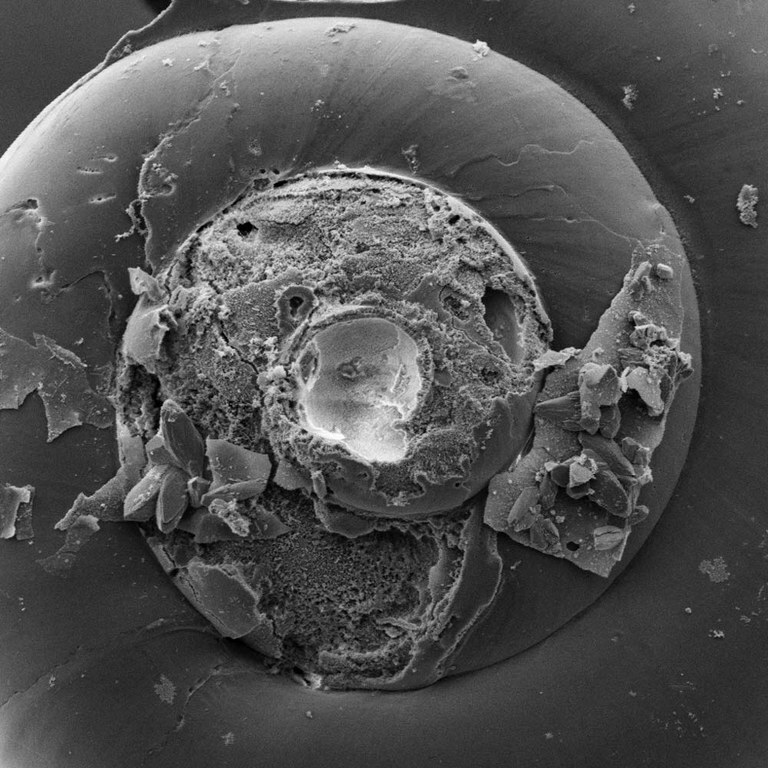 A pinhead-sized pteropod, its shell corroded by ocean acidification, seen through a scanning electron microscope. Pteropods form the basis of a marine food web that includes everything from seabirds to Pacific salmon. The economic calamity caused by ocean acidification in 2007 and 2008 caught the attention of many people, including then-Washington Gov. Christine Gregoire. Washington’s seafood industry generates more than 42,000 jobs and $1.7 billion a year, from industry profits and employment at neighborhood seafood restaurants, distributors and retailors. What’s more, shellfish have significant and growing cultural and resource value for the region’s tribal communities, especially as salmon stocks plummet. Gregoire created the Washington State Blue Ribbon Panel on Ocean Acidification in 2011. Five years later, the panel would become the springboard for the International Alliance to Combat Ocean Acidification, which has united local, tribal and national governments from around the world, though the U.S. government has yet to join. Today, the Pacific shellfish industry is at 50 to 70 percent of historic production levels. “We’re all really freaked out about ocean acidification,” Dale said. “What we realized is that it’s not going to change in our lifetime — the causes of acidification — so what we want is tools to manage around it.” For the past decade, NOAA provided many of those tools through its Integrated Ocean Observing System, or IOOS. But research and management programs depend on the political climate as well as the physical one. As NOAA funding has decreased, Pederson told me, scientists have come to rely more on industry data. A graduate student conducting research at the Quilcene hatchery showed me a Burke-o-lator in a cramped plastic shed. The device was broken, and hatchery personnel had neither the time nor expertise to fix it. Hales, I was told, was working to create a new version that was more mobile, user-friendly and affordable. Because of ocean acidification, multiple Pacific Coast hatcheries have tried relocating their operations to Hawaii, though they’ve struggled there as well. Some hatcheries are researching another approach: selectively breeding oysters that are more tolerant of lower pH levels. It’s possible, too, that growing shellfish near seaweeds and seagrasses — which take up carbon dioxide — could help. I spoke with two senior scientists — one in California, one in Washington — who have experimented with growing kelp and are now analyzing their results. But it may take years before researchers know whether planting kelp in coastal waters helps. There are no easy solutions to ocean acidification for the shellfish industry. In the meantime, as acidity levels increase, shellfish become ever more vulnerable. Right now, only baby shellfish struggle in the Eastern Pacific’s acidifying waters, but eventually, adult shellfish may, too. A worker tends the tanks outside the Taylor Shellfish Farm hatchery in Quilcene, Washington. The tanks hold various types of algae that help the bivalves bred at the hatchery grow to a size at which they can survive the increasingly acidified coastal waters into which they’ll be seeded. It was an overcast Thursday dawn when I boarded the Clifford A. Barnes, a 65-foot research vessel anchored in a Puget Sound marina. “Cliffy,” as the ship is affectionately called, belongs to the National Science Foundation. As I stumbled onboard, most of the crew, led by Chief Scientist Marine Lebrec, who wore green waterproof boots and a sky-blue down jacket against the chill morning air, were hustling to cast off or hunched silently in the small galley over phone screens and steaming mugs. Under the captain’s watchful eye, Cliffy quietly motored out of the dock and into the mist rising from the slate-colored waters. Later, when we were underway and caffeinated, the researchers — who were living onboard in cramped bunk beds — began their grueling routine of hauling in sampling gear and nets at mapped locations, rushing to preserve and process samples, and resetting the gear for the next stop. In between, they showed me what they’d gathered from the sea: assemblages of tiny crustaceans to be sorted, pteropods to be checked for corrosion, water to be analyzed for everything from dissolved oxygen content to chlorophyll levels, crabs for dinner. A pair of bald eagles gripping the bare branches of a snaggled tree passed on our starboard side; two dolphins swam in our wake. The water that Cliffy nosed through turned teal blue, provoking excited speculations about a “coccolithophore” — a one-celled phytoplankton — bloom. “I haven’t seen this in 40 years of sampling here,” one researcher told the others. Much of the collecting was on behalf of researchers not present; the boat bunked only six, with two spots reserved for undergraduate volunteers. The scramble to collect everything at each stop didn’t let up, even when a cold, steady rain began. For lunch, researchers slipped into the galley briefly in ones and twos and slapped together thin sandwiches, then ducked back into the lab built on the deck. 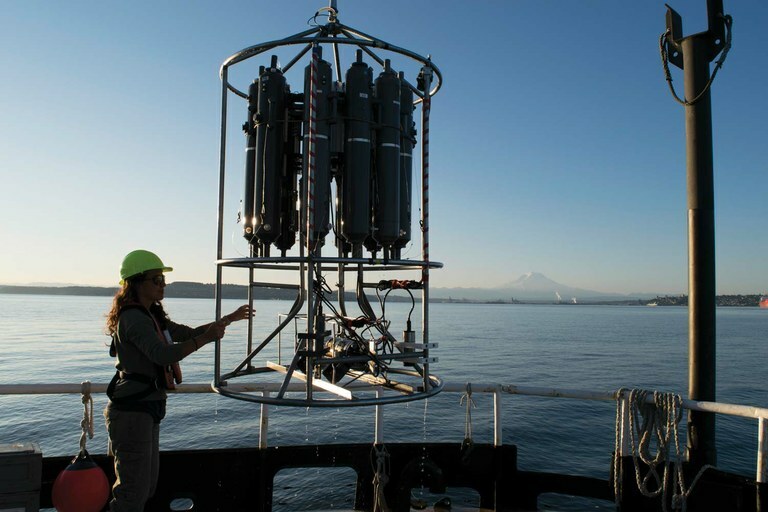 Washington Ocean Acidification Center, or WOAC, research cruises ply Puget Sound three times a year, collecting water chemistry data and dragging plankton tows, a combined effort to study chemical cause and biological effects of ocean acidification. On this cruise, postdoctoral fellow Ramón Gallego collected floating DNA samples, or eDNA, from the water to find out what had passed by recently for a new collaboration combining that data with ocean acidification research. “We think that areas with less ocean acidification will have more species richness,” he said. Gallego used a preservative to kill any living organism in the water sample, so that small microscopic bits of life didn’t eat the even smaller bits before he’d had a chance to analyze them. Originally from the Canary Islands, Gallego spent several years in Madrid in mainland Spain during his 20s. “I don’t want to live away from the ocean anymore,” he said. Funding limitations hamper biological monitoring, even though researchers must study complicated factors in combination: marine species reacting to changes in pH and temperature and hypoxia together, for example, or looking at more than one organism at a time in the field, which is tricky. WOAC funds laboratory experiments on the effects of ocean acidification on salmon, black cod, crab, copepods, euphausiids, oysters and other Washington species. Still, “we’re limited in what we can do at this time,” Klinger admitted. Because it’s very difficult to do lab studies that resemble the natural world, some of the best studies from the field come from underwater seeps. Just by chance, the natural carbon dioxide leaking from underwater volcanoes into seawater mimics the expected change in pH due to ocean acidification. When carbon dioxide levels cause enough acidification at a seep, the area becomes overgrown by seaweeds, and animals disappear. 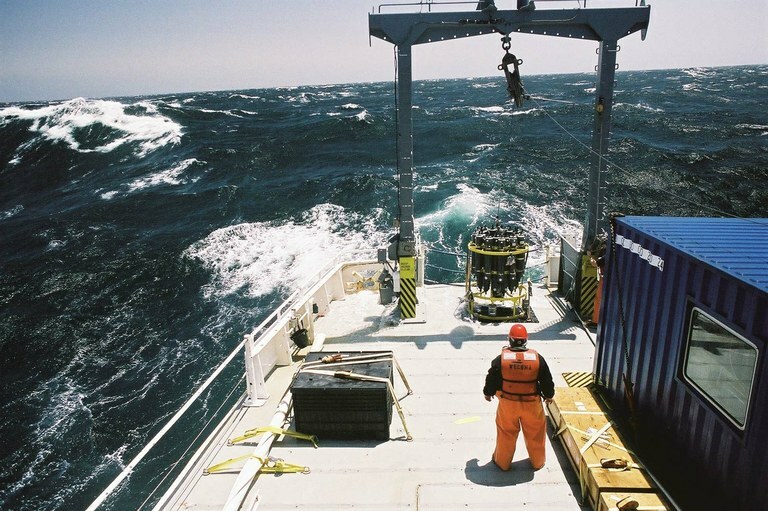 Oceanographer Richard Feely stands on the deck of the research vessel Wecoma during a 2007 research cruise. Using canisters and sensors lowered by winch into the sea, scientists recorded corrosive waters from Vancouver Island to Baja California. Back on Cliffy, as the sun broke through, crewmembers stripped off their rainclothes. Expensive vacation homes began to dot woodsy hillsides, glowing in the late afternoon light. Everyone looked forward to the end of the workday, when Cliffy would dock at the only place the researchers would be able to shower for the entire voyage: an extremely expensive resort, some of whose guests arrived by seaplane and private yacht. I wondered how much the guests in that idyllic setting understood about the biogeochemical processes happening around them — because of them. Because of all of us: Perhaps a small quantity of the carbon dioxide that acidified these waters emerged from the tailpipe of the moving truck that my parents drove from New York City to my New Mexico birthplace some 40 years ago. Pacific oyster larvae from Taylor Shellfish Farms. 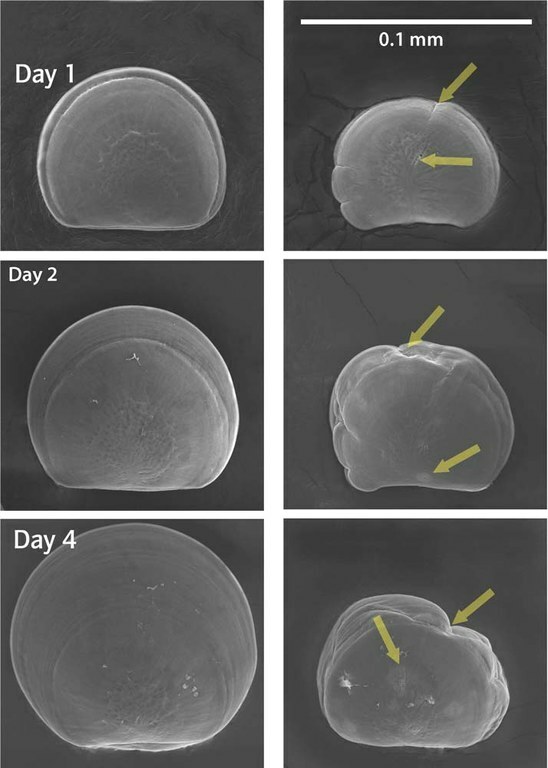 Shellfish develop normally in low dissolved carbon dioxide levels, left. In high dissolved carbon dioxide levels, right, seawater becomes acidified. Shellfish struggling to pull enough calcium from seawater for shell formation run out of energy and starve to death. The fate of the oceans can’t easily be predicted, but ominous signs are floating all around us. You could scoop up some of the most telling into your hands, but they are so small they would drip through your fingers without your noticing. In a rare moment of downtime toward the end of the cruise, scientist Natasha Christman showed me image after image taken by scanning electron microscope of tiny coiled shells in different stages of dissolution. Microscopic planktonic snails with body parts like wings, pteropods — or sea butterflies — are as delicate and beautiful as their name suggests. Pteropods are exceedingly sensitive to acidification, so researchers use them as indicators. In extra-acidified water, the small snails don’t die right away. Instead, they crumble, exhausting their resources trying to repair their shells. 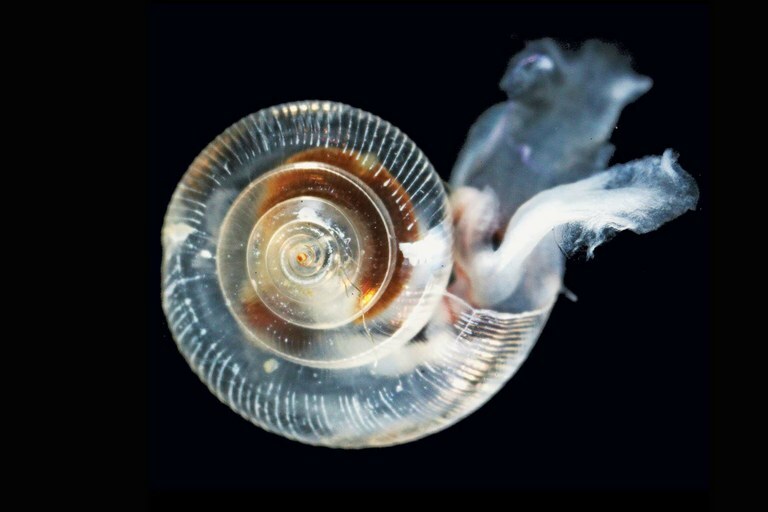 By 2050, as much as 70 percent of the pteropods on the outer continental shelf may be destroyed by upwelling events, up from about 50 percent currently. Before the Industrial Revolution, upwelling events harmed only about 11 percent of pteropods, which form the basis of a marine food web that includes everything from seabirds to Pacific salmon. Because ecological knowledge about ocean acidification is in its infancy, solutions-based endeavors are, too. But there’s a growing enthusiasm for finding those solutions. Newton also focuses on refining the information that WOAC provides to shellfish growers. She wants them to be able to look up acidification predictions for their localities on their smartphones as easily as they do weather predictions. “Knowledge is enabling,” she said. Regional solutions necessary require triage. The ocean might recover on its own from ocean acidification through slow planetary processes: the weathering of rocks and dissolving of calcium carbonate in marine sediments, mixed into sea water by ocean circulation patterns but this would take up to hundreds of millennia. After we docked Cliffy and ate freshly boiled crabs — cracked open with pliers from a toolkit, so sweet we skipped the butter — I joined the crew in walking to the resort, where they would shower and have a drink and I could text a cab for the long drive back up Puget Sound. On the way to the resort’s outdoor bar, we passed a wedding party gathered on a green lawn that stretched to the water’s edge. The adults chatted and laughed together over drinks in the setting sun. A few small children clambered over a stone walkway to the beach, where they crouched in the fading light, picking through the rocks in search of shells. A pteropod, or sea butterfly, collected by scientists from waters off the West Coast, with a shell corroded by ocean acidification. Signs include white lines, white spots and pock marks. In extra-acidified water, the small snails don’t die right away. Instead, they crumble, exhausting their resources trying to repair their shells. Note: This article has been updated to reflect Ramón Gallego's correct title as a postdoctoral fellow, and to clarify that ocean acidification results from human-produced greenhouse gas emissions, not global warming. Global warming is another result of human-produced greenhouse gas emissions. Maya L. Kapoor is an associate editor with HCN. She writes about science and the environment in the urbanizing West.